The modern-day lifestyle has ingrained people with the notion that people go to the gym to have better abs, develop their chest muscles or even tone their skin. Many people often neglect working their legs and the end game is an individual with a masculine upper body supported by a skinny lower body. This should not be the case; and all body muscles should be equally tones, including the legs. For you to develop your leg muscles, you will need to start using or but the best leg press machine. 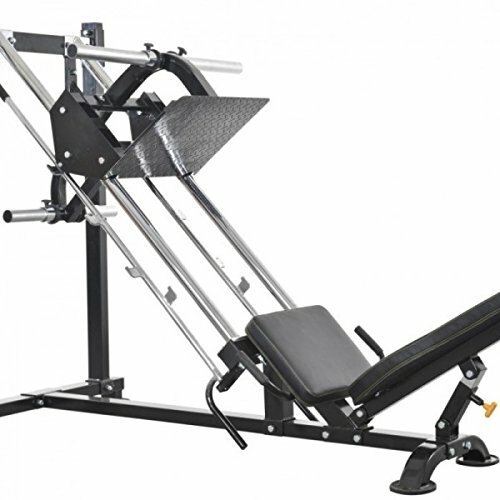 Although there are variations, the most common leg press machine design usually consists of a recline seat below a large sled with a rack to add weights. What is the Best Way to Use a Leg Press Machine? Many people often overlook the importance of a leg press machine unaware of the benefits they are missing out on. Although squats may have more advantages overall, here are a few reasons why the leg press machine is a piece of equipment to be taken seriously. For people who want to develop their leg muscles, this is undoubtedly the machine to go for. The leg press, which is a compound exercise, trains all the major leg muscles simultaneously and in a natural squatting movement. Being a multi-joint exercise, the leg press workout requires that all the leg muscles work in coordination to work the weaker muscles more and increase joint stability. 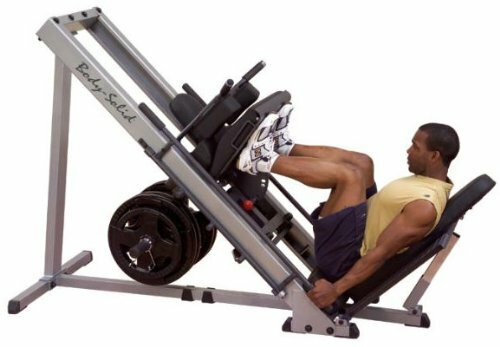 Leg press exercises should be performed before doing any muscle isolation exercises. Besides, this compound exercise requires greater concentration and thus shouldn’t be performed with fatigues muscles. Performing squats regularly with heavy weights can strain your back. However, with a quality leg press machine – one with sufficient back support, you can relieve your back the stress that comes with doing squats. Besides, leg press exercises do not require you to exert direct pressure on your spinal column thus making the leg press machine extremely safe for leg workouts. Although spinal loading in and of itself is not dangerous, it should not be done extensively by individuals with current and recurring back problems. A leg press machine eliminates the issue of spinal loading since all the weight is sled on an angle. This implies that the load does not bear down directly onto the vertebrae. Assuming that you’re already well-suited to do squats, performing leg press exercises acts as a catalyst for squat strength increase. This makes a whole lot of sense because the leg press is basically the same movement as that of a squat with the only difference being that it is done with a different torso angle and in a different direction. Since the leg press does not require as much stabilization or balance as the squat, it’s easier to add more weights and introduce more stress to the leg muscles. This surely applies to any other kind of physical effort exerted on the body, including leg presses. By using the leg press machine to work your lower body, you will shed the stubborn calories and at the same time increase your overall physical resistance, especially on the lower body. Also, performing leg presses activates your abdominal muscles since you are exerting a lot of pressure on the abdominal area while pushing the weights forward or upwards hence you’ll burn calories faster than usual. Since the leg press machine is an incredibly simple equipment with very few moving parts, a majority of beginners can perform leg press exercises correctly with very brief instructions. Unlike more sophisticated free weight exercises that have a longer learning curve, a beginner can get the most out of a leg press machine with their first workout. For you to use this machine effectively and get the most out of it, you must first be conversant with the muscles to target. When using a leg press machine, you will be working the lower body as a whole, which consists of three parts: the glutes, thighs, and legs. The glutes comprise several muscles that attach to the hip ﻿﻿﻿joint, thighs consist of various muscles that attach to both the knee and hip joints, and the legs consist of two muscles that attach both the ankle and knee joints. To perform leg press exercises, you need to position yourself seated on the machine, resting back against the back pad, and placing your feet at roughly shoulder-width apart on the footplate. Now inhale, release the footplate for your set, exhale and then press the footplate all the way up until your legs are fully ﻿﻿﻿extended. However, be sure not to lock your knees. If you want to maximize your workout time when training your lower back, be sure to focus on compound exercises. Generally, compound exercises work multiple joints or muscle groups simultaneously and the leg press is an excellent option for this. While this may be a burden for you, it helps you exert stress on different muscle groups of the lower body. Placing your feet towards the top of the footplate stresses the glutes and back of your thighs whereas placing your feet lower or close together shifts the emphasis to the front of your thighs. Spreading the legs exerts more stress to the inner thighs and is excellent if you have back problems. led Carriage - 1,000 lbs. This leg press machine from Powertec is an elite piece of equipment that has a simple and plain construction. This leg press is constructed with a heavy steel frame that gives it a weight capacity of 1000 lbs. This implies that this machine with neither fall apart on you nor will you outgrow its capabilities. Another impressive feature of this machine is that it incorporates a revolutionary carriage system that gives you a smooth weight training experience. This leg press machine is equipped with two safety levers on each side of the reclining bench which give you peace of mind that nothing will go wrong even when your workouts get intense. The machine’s footplate is also wide enough to provide widespread support surface for you to better work your leg muscles. This piece of equipment is the pinnacle of performance and is very friendly for beginners. One excellent feature of this machine is its Quad track roller system that not only gives it a smooth operation but also distributes the weight evenly. 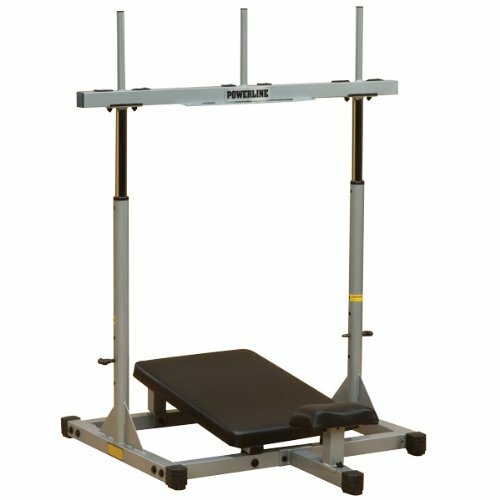 The ultra-heavy foot platforms make this machine an excellent option if you want to exercise in the leg press positions. In terms of comfort, this machine is on a level of its own all thanks to its extra-tough, double-stitched, 4-inch thick, contoured shoulder and back pads which offer excellent support to the shoulders and back even when you’re performing the most strenuous activity. The machine’s three lock positions make it incredibly convenient and safe to use for your leg workouts. Even better is that is machine boasts of a 1,000 pound weight capacity which makes it ideal for super-powerful leg. If you’re looking for a machine that offers you an excellent, yet cost-effective option for a home gym, then the Powerline Vertical leg press is machine to go for. With its vertical design, this piece of equipment will require you to push against gravity thus testing and strengthening your legs more. The extra-thick back pad and contoured neck and head pad not only offers optimal comfort during your workouts but also safety when working out. Regarding safety, this machine comes equipped with a half-inch locking pins to ensure that the weights you’re lifting don’t come crushing on you. Besides, the three starting and stopping positions make this machine versatile for people of different heights. Long term use of this leg press is assured all thanks to its durable alloy steel construction and ultra-tough powder-coated finish. If you’re looking for a user-friendly, multi-functional and cleverly engineered machine offering a free-range of movements, the look no further. 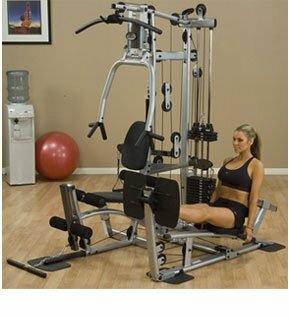 This machine offers a way to accommodate many other smaller pieces of workout equipment in a small floor space. By combining a functional training arm and an ergonomically positioned arm press, this machine lets you have a taste of functional training and traditional exercises in one machine. The Powerline Home Gym also comes with an adjustable seat that lets you perform your leg press exercises comfortably. What’s even more exciting about this machine’s that you are not limited to a single exercise. It’s a leg press and also everything else you’d want to exercise other body muscles. This home gym machine offers maximum comfort and versatility all thanks to the well-padded benches that support your back when you’re working your legs. If you’re a gym enthusiast whose desire is to own a basic leg press machine with exceptional functionality, the Premier Vertical Leg Press is here for you. It is a durable and safe piece of equipment that allows you to get an excellent work out on your quads, hams and legs. The reliability of this leg press machine is second to none, all thanks to its heavy-duty steel framing and rollers that make sure it rides smoothly as you press against it. Regarding safety, this leg press machine is in a world of its own. It boasts of a deluxe three-inch stitched padding that offers optimal back support for the most comfortable leg exercises. It’s also equipped with several steel stoppers which prevent you from getting crushed under the weight of the heavy iron. Assembly instructions are not quite clear hence you may need more time to set it up. 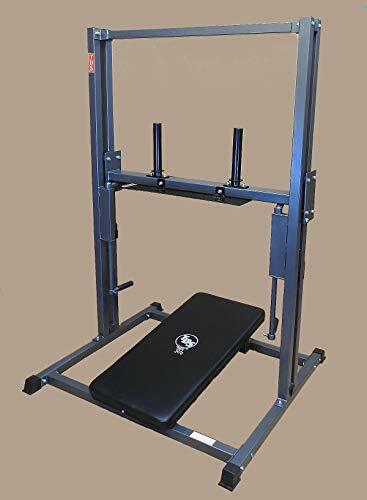 While most of the leg press machines we reviewed had mouth-watering qualities, none of them could combine quality, functionality and comfort, all in simple design like the Powertec Fitness Leg Press, Black which makes it our best product in this category. To begin with, the packaging of this product is just meticulous and better yet, its quality is what one would expect from its price tag. In addition, this product comes with an unlimited, unqualified lifetime warranty so there is nothing to worry in case a nut comes loose. What’s even more breathtaking about this leg press is its smooth yet stable weight carriage releases and safety catches that assure nothing short of excellent security when you’re pressing heavy. Buy this leg press! You may like: Best Olympic Weight Bench. Read the reviews ﻿﻿﻿﻿﻿﻿here.